If you are a side sleeper, try to avoid sleeping on the painful shoulder for a couple of weeks. Sleep on the opposite side and place your painful arm on top of a half folded pillow to support it properly. You should feel like you’re hugging the pillow. If you recently had shoulder surgery, avoid sleeping on it for 4-6 weeks. Many people find that it is comfortable to sleep in a slightly reclined position using a bed wedge or even on their recliner. A chair is not as ideal, but early on it might be the only way you can get comfortable. If you sleep on your back, roll up a small towel and place it under the arm of your painful shoulder. For stomach sleepers, try to keep your injured shoulder at your side, close to your body. You can also try adding a pillow under your chest to elevate your body to avoid straining your shoulder. If you recently had shoulder surgery, avoid laying flat on your back. Using a wedge pillow is helpful and should be used if you prefer to sleep on your back. The rest of the tips are for people with non-surgical shoulder pain. In other words, if you recently had shoulder surgery, these tips aren’t for you! If you absolutely have to sleep on your injured shoulder, try the shoulder gutter trick. It’s a way to elevate the rest of your body, creating a sort of ‘gutter’ for your arm to rest in. Position a pillow under your trunk/hips. Place a second pillow at your neck/head. Here’s the basic layout of the shoulder gutter pillow setup. Adjust the height by adding or folding pillows under your side so that you create space for your injured shoulder to rest. You create better alignment for your shoulder by elevating your trunk with a pillow under your side. This helps to relieve the pressure placed on your shoulder. If you have difficulty making this work, look for a wedge pillow that has a cutout for your shoulder. I recently found an answer to sleeping on a painful shoulder. There is a specialized pillow for people who experience acid reflux. The MedCline Advanced Positioning Wedge is marketed to help with GERD or acid reflux, but the design is really ideal for people who sleep on their side. The pillow relieves some of the pressure on your injured shoulder by allowing the shoulder to slide through the opening of the pillow. 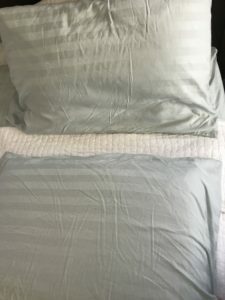 It’s not cheap – the pillow costs about $200. But if you have been battling an injured shoulder for weeks or months, this might be the answer you’re looking for to get the sleep you need! If you’re looking for a cheaper offer and you can tolerate lying on on your back, check out this wedge pillow for $30 on Amazon. What are some tips that you’ve found to sleeping on a sore shoulder after an injury or after surgery?